Lemongrass, ginger, and a bit of red pepper give this Chicken Soup a warmth that will keep you coming back for more. Nothing says winter like a bowl of chicken soup. Here in Miami we don’t get a lot of cold weather, but I can still appreciate a good bowl of soup and this soup rocks. We actually ate it twice this week, and may be having it again. This was my first time experimenting with lemon grass, and I will definitely be trying it out in other recipes. This particular soup reminds me quite a bit of a Thai soup that we often get when we go out to eat. It is a bit spicy, but you can easily adjust that. The lemongrass, ginger, and garlic give a nice depth of flavor. I pour the broth and noodles over the spinach so that it wilts it, but does not overcook it. If you don’t like spinach, you can always leave it out. It is still really good. Perfect for a cold day or if you are feeling a bit under the weather. This is the chicken soup you want when you come inside on that one cold Miami day where you actually put on shoes instead of flip-flops. There is not a whole lot of prep for this recipe. Everything is put in the pot and forgot about for awhile. I’m betting it could even be made in a slow cooker (though I wouldn’t know, my hubby, as great as he is, doesn’t trust an appliance you turn on and leave on to cook your food all day while you are gone). The hardest part, if you can even call it hard, is straining the soup so you can get a clear broth. Of course it is gluten-free! Everything on this blog is gluten-free! Just a couple quick notes. Always double check to be sure any chicken broth you use is in fact gluten-free. Not all of them are. I use rice noodles for this soup, you could use another type of gluten-free pasta and I am sure it would be great, we just happen to be in love with rice noodles. One last note, I am a huge fan of lemon (on everything) so I added a good squeeze of lemon to mine, while my husband added some extra grated ginger to his. Delicious. Brown, skin side down for about 5 minutes. Add 8 cups of water and 2 cups of chicken broth. Add lemon grass, ginger, garlic, red pepper, salt, black peppercorns, and onion. Strain broth into a new pot. Add chicken back to broth and bring to boil. Add desired amount of rice noodles and cook until done. Place spinach in bowl and spoon soup over. Grate additional ginger or squeeze some lemon if desired. Rice noodles will absorb water as they sit in the broth. If you do not plan to eat all of the soup the same day (or you want to freeze it until later) wait to add them until you are ready to eat. This post is linked to Vegetarian Mama’s Gluten-Free Friday Recipe Link-Up. This soup makes me want to cozy up and make fresh bread! Great recipe for the upcoming winter! I love simple recipes like this. I am always so busy and don’t have a ton of time to spend in the kitchen. I bookmarked your site for later! I am trying to eat better. I could use more recipes like this. This looks amazing! I love making soup this time of year! This soup has my name all over it! I adore lemongrass and never have enough ideas for using it. And rice noodles are a staple around here! Awesome timing! The hubs has a case of the sniffles and this will be perfect! Looks delish! I love the addition of lemongrass to this soup. The rice noodles are a great gluten-free alternative too! Nice! This sounds yummy. Will have to try it. Wondering about the straining though. Is it to get rid of the cut ginger and other bits? This recipe looks delish! Can’t wait to try it! We made this last Sunday when it was finally chilly out…though my hubby doesn’t care if it’s cold or not…I was going to order wings the other night, but he wanted this soup instead! What a great recipe! I love ginger and having it in a nice warm bowl of chicken soup makes it all the better. Will definitely be trying this recipe out. Enjoy! Be sure to let me know how you like it! Ah this soup sounds absolutely divine. Ginger and lemongrass are the BEST! They are! This was my first time experimenting and I’m hooked! 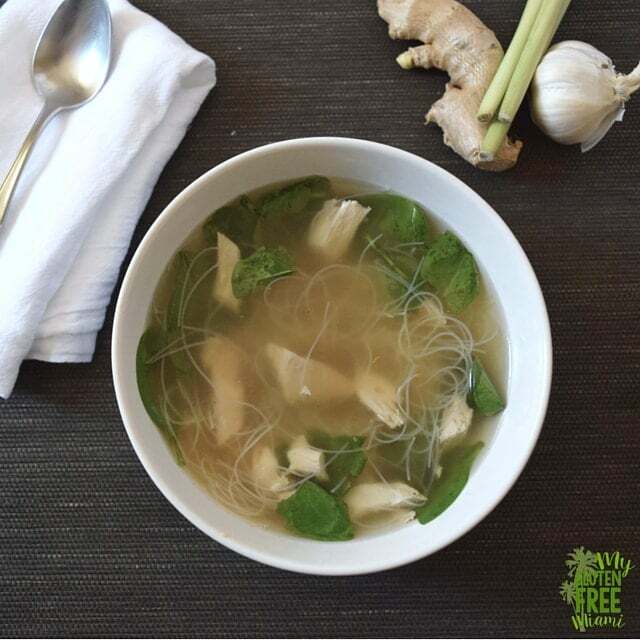 Lemongrass and ginger are such a restorative combination in soups. I am arming myself with soup recipes to get through the winter! I love soup! It doesn’t get cold often in Miami, but I still love soup! They are! I had never experimented with lemon grass before, but I have found a new love! I love the sound of this soup. I bet you could use leftover holiday turkey is this as well. The ginger is a super yummy idea! Turkey would be great! We actually used our leftovers to make Aguadito de Pavo, which is a spicy cilantro turkey soup, recipe coming soon! Yum. This looks like a lovely soup with just the right amount of spicy. Thanks, Amanda! Thanks! It is so good…the first time I used a teaspoon of red pepper and it was a bit much for me, but my husband loved it…My mouth was a bit on fire :)…so I dropped it to a half and it’s perfect!